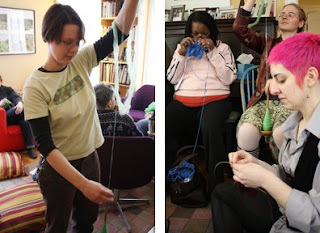 On March 1st, 2008 I attended a Boston Handmade skill share workshop on knitting led by Lynne and Louise. The next day I had a business meeting at the back of a local cafe and upon leaving the cafe I stopped dead in my tracks as I saw a group of women knitting. It was kismet! The knitting group welcomed me into their circle with open arms, and the past year of knitting has had a monumental affect on my life. No, I am not exaggerating. I still can't believe that knitting did not find me for over 30 years of being a sentient being on this planet, but now that it has, and I have found such a strong community of yarn enthusiasts, there is no turning back. 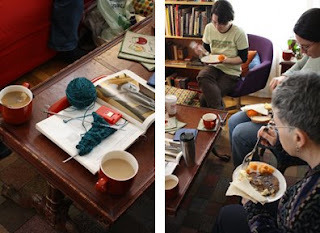 To celebrate my One Year Knitaversary I invited the whole knitting group over to my home for a day of yarn debauchery. Since we meet weekly for Sunday breakfast and a few hours of knitting, we began our day this past Sunday dining at my place on lots of tasty treats. There were about thirteen of us knitting socks, sweaters, hats, scarves, gloves, and more. It was incredible to have this much knitting in my very living room since usually it's just me clicking away, with my husband untangling the yarn knots - he's got skills! There was also some spinning going on thanks to Stephanie, who was not only spinning her own yarn but she was also teaching others how to spin as well. In my opinion it's the great spirit of teaching and sharing that makes the knitting world so amazing. I have spent years in the fine arts where many techniques are secret, and many artists feel high competition with each other, in contrast, the knitting circle is a group of highly talented creatives I've found to be warm, comfortable and open. I've taken a couple of great knitting classes over the past year (at A Good Yarn in Brookline with Alison Hansel) but I feel like I have also learned a massive number of techniques, styles, basics, and flourishes from the Sunday Knitting Ladies (yes Ladies, that's what I call you) who are always open to answering my endless questions. Just to be clear, I did NOT have this celebration so that I would receive Knitaversary gifts. What I really wanted out of this day was to hang out with (and make pancakes for) all the wonderful women who have brought so much joy to my life in the past year through their love of yarn. However, the Sunday Knitting Ladies are such incredible people that they brought gifts of food, coffee, yarn, and knitting notions! Thank you to Alice for raiding your stash for some beautiful Alice-style purples and neutrals to work with, to Jen for the awesome spools of bright and shiny yarns, and to Diane who gave me the most incredible assortment of handspun and hand dyed yarn and also new knitting needles to work them on - I can't wait to show what I create with this new found treasure! 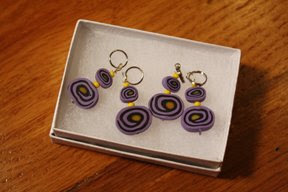 Andrea surprised me too with a gift of special stitch markers - that she made herself! The talents in this group know no bounds. Thank you Andrea! - I feel honored and touched by everyone's generosity and thoughtfulness. And speaking of stitch markers, Mary showed me her current sweater project on which she is using her favorite markers made by none other than Boston Handmade member Marla of Sea Glass Things. Marla, Mary says "hi!" If you haven't tried knitting yet, I highly recommend it. If you already knit, are you on Ravelry? If you're already on this fantastic on-line knitting and crochet community called Ravelry, let's connect! 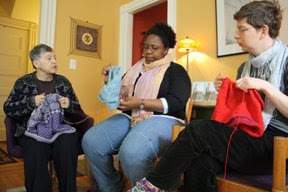 My screen name is BurkoKnits and you can connect with all us Sunday Knitting Ladies by joining the Boston Yarn Party group on Ravelry too. Wanna see some of my knitting? You can purchase my work through Usable Goods, and you can see pics of projects I've worked on during the past year in my Flickr photo pool. You know that you're worth it, baby! Yeah for knitting! What a great group you have! Mary's sweater is gorgeous - and how I would love to know how to spin! 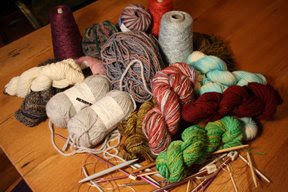 It's so inspiring that such a simple thing like yarn can bring so many people together!